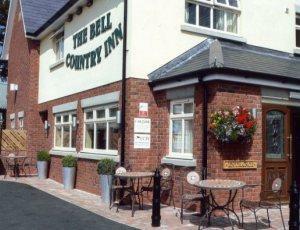 The Bell Country Inn01597 823959work InnWe are situated 1 1/4 miles on the outskirts of the beautiful Victorian town of Llandrindod Wells, which nestles amongst the Black Mountains and the Brecon Beacons. We are situated 1 1/4 miles on the outskirts of the beautiful Victorian town of Llandrindod Wells, which nestles amongst the Black Mountains and the Brecon Beacons. Refreshments have been taken for centuries in the site of todays Bell Country Inn. The hostelry was built for thirsty drovers taking their stock from West Wales to the markets of Gloucester and Hereford. The Bell offers guest accommodation comprising of 10 en-suite bedrooms, all to a high standard. Two bars and a restaurant. 1.5 miles NW of Llandrindod Wells on the A4081.